It’s not something I ever would have thought of growing myself. But when Emmett and I were wwoofing on a small family farm in New Zealand, our hosts had a few quinoa plants going. They were healthy, bushy, beautiful things, and their grains were just starting to dry. So, when we were on our online seed-spending spree a few months ago, we thought ‘why not?’ and ordered some Temuco Quinoa. It sounds fancy — and I went most of my life never having heard of quinoa — but it’s pretty practical stuff. It’s one of the few plant-based complete proteins — a protein that has all 8 amino acids. As such, it’s especially useful for a mostly-vegetarian like myself. (Other sources of complete protein include: spirulina, amaranth, soy, buckwheat, and hempseed, but I’m really not too sure how to serve some of those guys, besides blending them into some disgusting protein shake.) Quinoa’s also really pretty when cooked. 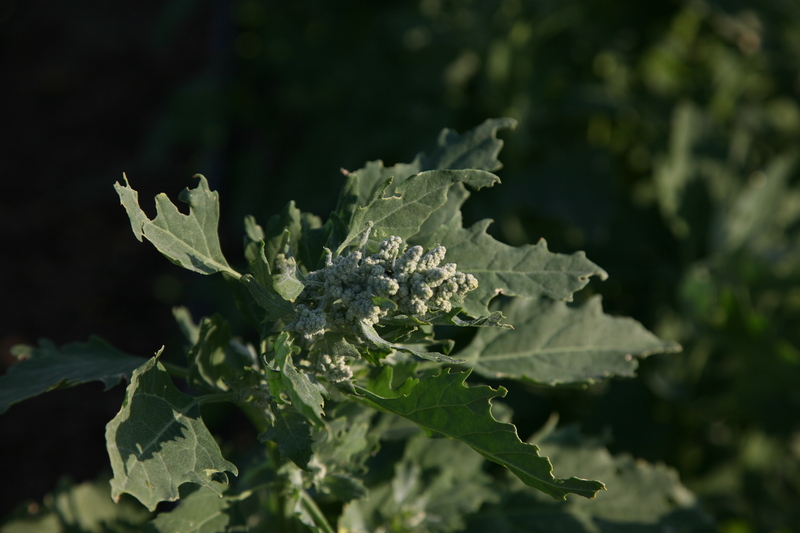 The little hard seeds, once boiled/simmered sufficiently, burst open into tiny white spirals. They’re a pretty and healthy addition to soup–just throw ’em in 15 minutes or so before your soup’s done–and can make a nice side salad on their own, with some seasoning and veggies thrown in. But back to the growing side of things. So far, so good: the plants have proved quite hardy. Sure, the cucumber beetles munched the leaves a bit, but let me tell you these plants looked absolutely wretched when we transplanted them. They were victims of our seed disaster–stunted, tiny things with only a couple of leaves apiece–and it was only Emmett’s deep-rooted sense of optimism that led us to put them in the ground at all. Good thing we did! They’re now hip-high bushes, vigorous and a pretty shade of grey-blue-green, and they’re starting to form buds. 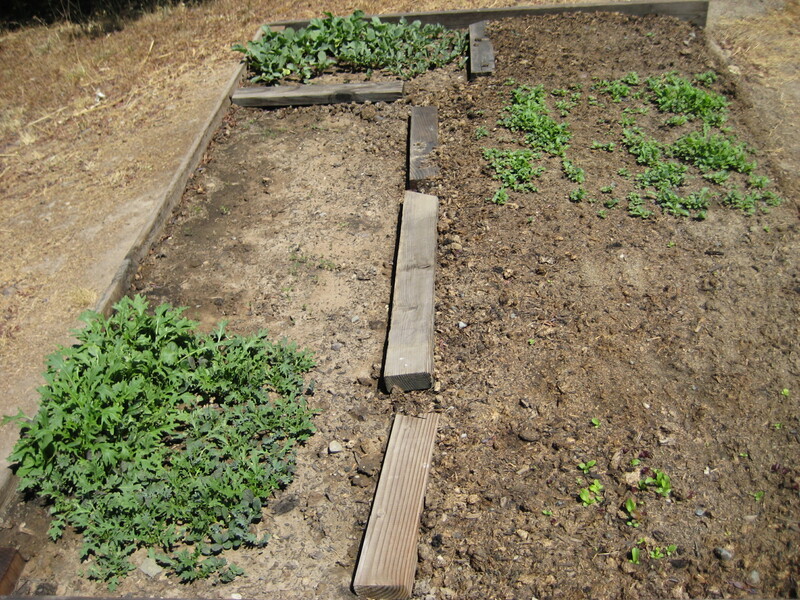 We’ve barely had to weed them–once they got going, they quickly shaded the weeds out–and water them about once a day. They haven’t minded our slightly soggy clay soil one bit. My only complaint: the stalks are on the brittle side, and break easily. 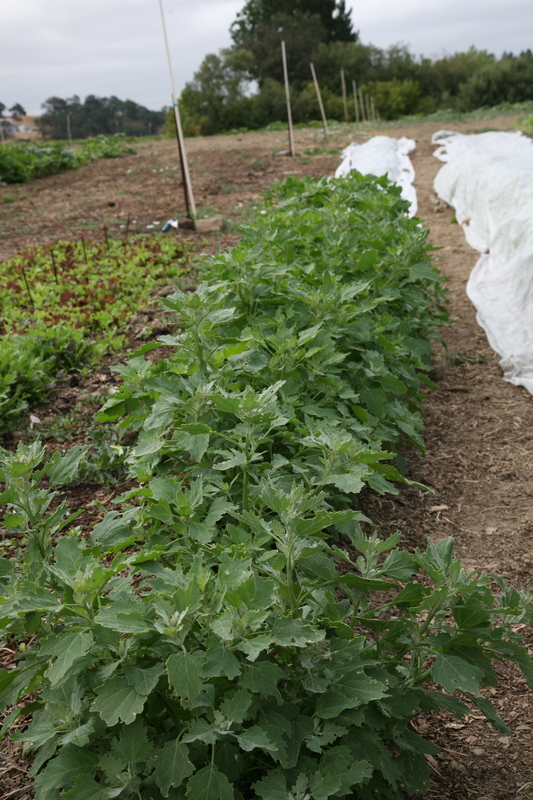 But really it’s our fault for planting them too close to the chard row, which we harvest a lot (which means I sometimes back into the quinoa while trying to snip chard leaves and avoid stepping on the chard’s floating row cover, which we take off and put on the ground). I’m excited for a quinoa harvest. If it’s successful, this might be something I plant in bulk in future years. It’s not too often you see grains at the farmer’s market, and I’m guessing people might be excited at something unusual like locally-grown quinoa. (I also have a hunch it might make an awesome protein supplement for chickens, but I’ll have to try that out first.) It’s a good storage crop; we’ve kept store-bought quinoa for close to a year without any sort of problem. Since most of our sales right now are in salad and chard, I can’t wait for something that doesn’t have to be harvested day-of-market! Today [June 22] was our first farmer’s market, and I’m exhausted. Then we turned to the baby brassica greens that we were selling as a lettuce mix (one that could also be tossed into stir fries or soups). 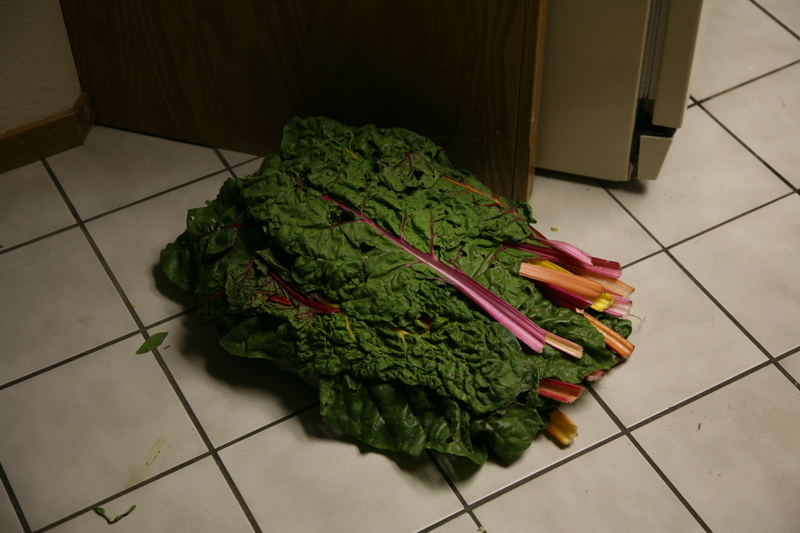 We snipped, soaked and, lacking a salad spinner, shook them as dry as we could before bagging them. Emmett was the official Salad Dancer, and will likely continue to salad dance until we’re really rich and can afford a gigantic, commercial-sized salad spinner — which judging by the cost of the scale will probably set us back at least $150. Then, off to the market! It was satisfying to set up our little stand and put our hard work out there for others to enjoy. While Emmett and I were a bit embarrassed by our bug-eaten produce — the arugula and bok choi were a tad on the green lace side — many of our customers didn’t seem to mind at all. “As long as it tastes good,” one lady said. A man sympathized: “Oh, I’m in the grape business, trust me, I know how it goes.” We’re grateful for their understanding — and were thrilled when people complimented our produce or bought multiple things. Two bags of greens, a bunch of radishes, that’s almost $10 in one fell swoop! For us, that’s a dinner out — two burritos and a shared drink. Other things of note: The radishes were a suprisingly big hit. I thought Emmett was silly to plant them, since I consider radishes to be a fairly dull affair. And to add insult to my radish injury, when we were re-reading the seed packet yesterday, we noticed that both varieties suggested that children plant them. “Fun for kids to grow! …almost disease free.” (In other words, our most successful crop so far is one that’s pretty hard to screw up.) Radishes: was it the color that attracted people? The fact that they’re so mundane, they’re rarely seen in the farmer’s market? We also put out fun radish recipes courtesy of the Radish Council, including a hot-and-sour-soup and a southwestern cobb salad. Maybe our customers were impressed by their versatility. Total market proceeds: $98. $9.80 went to the farmer’s market to pay for the use of the space and the organization. Another $25 went to pay our annual dues, since it was our first time at the market. Which leaves us with $63.20. And besides, we also got one beautiful red onion, one butter crisp lettuce head, two squash seedlings, and two bowls full of lovely orchids (of a species from Madagascar) from our neighbors at the farmer’s market, so really, we’re doing pretty well. I may be tired, but really, I feel great. 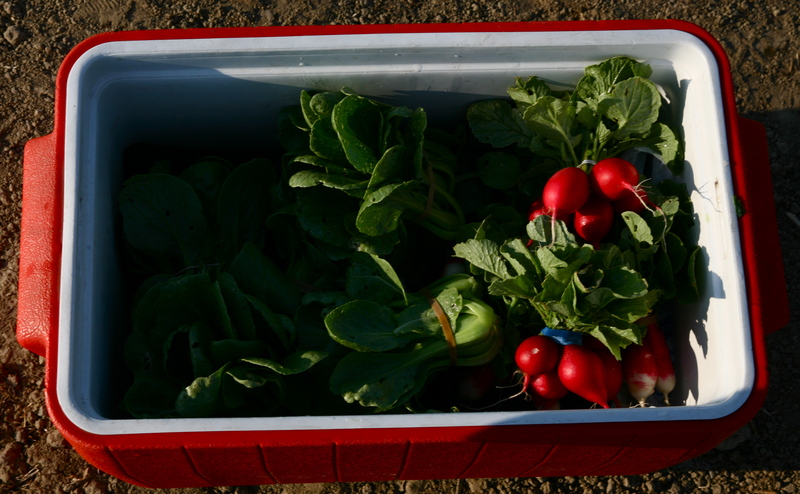 We have, approximately, 3′ x 4′ of baby salad greens, a host of summer-spicy radishes, and exactly nothing else. We’re going to the farmer’s market, baby. But I think, when push comes to shove, that we’re just going to be sitting at our little stand with some lettuce, radishes, a bit of rosemary, and maybe a garlic head or two.